More than a decade after the deadliest attack on U.S. soil, the U.S. administration seems no closer to identifying let alone repelling Islamist terrorists in the homeland. The 9/11 committee used the term "failure of imagination" to explain why the U.S. government was unable to prevent the catastrophic events of that day. But although the enemy was identified at that time, the Federal government and one of its most important branches, the FBI, have adopted a policy of scrubbing Islamism from public consciousness though since bin Laden's 2011 demise, "at least nine publicly known Islamist-inspired terror plots against the United States have been foiled, bringing the total number of foiled plots as of April 2012, to 50." 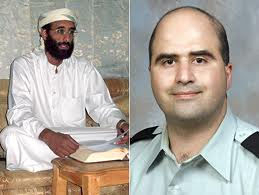 In November 2009, U.S. Army major Nidal Hasan (right) gunned down thirteen of his fellow servicemen at Fort Hood, Texas. Despite clear links establishing his connection to radical cleric Anwar al-Awlaki (left), the subsequent Webster report spoke only vaguely about generic "violent radicalization" while president Obama referred to the jihadist massacre as "workplace violence." The Obama administration's response to the 2009 Fort Hood terror attack by U.S. Army major Nidal Hasan offers a vivid illustration of this practice. In August 2012, an independent commission charged with reviewing the FBI's failure to prevent the attack issued its report, recommending eighteen changes in policies and operations. However, the commission, headed by Judge William H. Webster, upheld the government's policy of excluding Islamism from the findings, concluding that despite the intelligence failure, FBI personnel had faithfully followed protocols and procedure, and there occurred "no misconduct that would warrant administrative or disciplinary action." There appeared to be little appetite for finding the attack's root causes and its failed detection. Nor was corrective action an apparent priority. Instead, the directive focused on exploring "whether there are other policy or procedural steps the FBI should consider ... while still respecting privacy and civil-liberty interests" and "whether any administrative action should be taken against any employee." The report scrupulously covers the operational missteps and errors in the FBI's handling of the Hasan attack, detailing the substandard hardware, antiquated search tools, and inferior communications databases. Failure was exacerbated by lack of procedural clarity between the FBI's Washington Field Office, the San Diego Joint Terrorism Task Force, and the Department of Defense, all of which dropped leads and omitted information. It is a frightening read, detailing a course of events within the intelligence communities that should never have occurred post-9/11. The Webster report ought to have detailed what procedures resulted in Hasan not being flagged as a danger. Instead, it proposed general policy guidelines, some rather obvious and some further expanding chain of command. Of the eighteen recommendations, seven reference policy, five recommend technology and software improvements, and four recommend increasing compliance with the numerous bureaus protecting privacy and civil liberties. Only one proposal suggests operational changes, advising the training of Terrorism Task Force officers on FBI databases. The final recommendation concludes that no administrative or disciplinary action be taken. Meanwhile, an earlier congressional investigation led by senators Joe Lieberman and Susan Collins, concluded that the FBI "collectively had sufficient information necessary to have detected Hasan's radicalization to violent Islamist extremism but failed both to understand and to act on it." Yet the Webster commission barely mentions Islam in the body of the report. The underlying justification for omitting this factor is encountered in Part 1, Factual Findings: "The FBI's report on terrorist acts in the U.S. … identified 318 events … and only 7% of those events were attributed to Islamic extremists." Statistics such as these are easily manipulated at the D.C.-based Worldwide Incidents Tracking System (WITS) site by selecting specific criteria. Moreover, the Webster report undermines this fact when it lists the successes of the FBI's terrorism task forces: Of the sixteen examples of major terrorist plots foiled, all were planned by Muslims. One might also look to the selection of the committee members assigned to investigate an Islamist-inspired terror attack on the U.S. military for further explanation of the omission. None of the investigators and attorneys chosen were experts in Islamist extremism: Douglas Winter is an IT specialist; Adrian Steele, an antitrust and regulatory law expert; Russel Bruemmer, a financial institutions professional; Kenneth Wainstein, an expert in corporate internal investigations and civil and criminal enforcement; and William Baker is a criminal and counterterrorism specialist, and was the only member with a modicum of expertise in Islamism. The commission also consulted with "public interest groups that promote and protect civil liberties and privacy interests." In fact, the only exhibit appended to the report was a lengthy treatise from the American Civil Liberties Union, an organization that has distinguished itself by frequently contesting counterterrorism measures proposed by the government since 9/11 as an infringement on civil rights. Thus the word "Islamic" is mentioned a mere thirty times in the 173-page report. Most instances have no significance, including eight referring to proper names while seven refer to "radical Islamic cleric" Anwar al-Awlaki, Hasan's jihadist mentor. Almost half the mentions, ironically, come from Hasan's own e-mail correspondence. The Webster report wascriticized by senators Lieberman and Collins who worried the "report fails to address the specific cause for the Fort Hood attack, which is violent Islamist extremism." The sad truth is that the bulk of the blame for this sorry state must be assigned to guidelines that handicapped agents in identifying Islamist threats. The report holds no agent accountable for failing to follow FBI protocols since the chain of command and protocol is dictated to the FBI by the appointed attorney general. Implementing the Webster commission's recommendations cannot prevent a similar, future attack while there is a concerted effort coming from the Attorney General's office—and ultimately the White House—to obfuscate the main motivation, Islamism. The Webster report presents a nebulous definition of generic "violent radicalization," in line with similar attempts by the Obama administration to wipe out the Islamic component of jihadism when discussing similar incidents. When the president referred to the Fort Hood attack as "workplace violence," some chalked it up to political posturing rather than systemic policy. It was not. The report provides an elaborately defined process of "radicalization," describing a progressive condition that may be applied generically "whether based on religious, political, social, or other causes." It occurs when followers "submit to the collective identity and leaders identify a shared enemy as a target for violent behavior." The report further states, "Although highly publicized terrorist plots and acts—and the Fort Hood shootings—have referenced Islam, violent radicalization transcends any one religion—and, indeed, religion—and can find causes in political, social, environmental, and other contexts." Not many would agree that "referencing" Islam is what Islamist terrorists are doing. The report cites four steps to radicalization: pre-radicalization, identification, indoctrination, and action—all taken from a 2007 FBI paper and presented in parallel with a psychiatric definition. Ironically, the original FBI model used by the report was framed in the context of Islamic extremism, but this context is absent in the Webster report. Turning to Hasan's actual process of radicalization, the Alice-in-Wonderland world of contemporary counterterrorism comes painfully into view. Despite a final tally of eighteen communications with Awlaki, FBI agents concluded that Hasan was not violently radicalized because they were "not aware of any evidence that Aulaqi instructed any of these individuals to engage in violent acts." Such a conclusion is both ignorant of the nature of jihadism and false. As Evan Kohlmann, a counterterrorism researcher, notes, "Al-Awlaki condenses the al-Qaeda philosophy into digestible, well-written treatises. They may not tell people how to build a bomb or shoot a gun. But he tells them who to kill, and why, and stresses the urgency of the mission." In February 2008, nineteen months prior to Hasan's attack, The Washington Post reported that U.S. officials had linked Awlaki to terrorism: "'There is good reason to believe Anwar Aulaqi has been involved in very serious terrorist activities since leaving the United States, including plotting attacks against America and our allies,' an anonymous U.S. counterterrorism official tells the Post." In addition, newspapers list several Islamic terror attacks in connection with Awlaki: the 2005 London subway bombing; the June 2006 plot to bomb Canadian buildings; the planned attack on Fort Dix, New Jersey, disrupted in May 2007. More disturbingly, following Hasan's 2009 massacre, when the FBI had thoroughly analyzed Awlaki's role in inciting attacks, two more Awlaki devotees nearly succeeded with attacks in December 2009 and 2010—failing only due to the terrorists' incompetence. In an e-mail to Awlaki noted in the report, Hasan confides that "[Here in the U.S.] you have a very huge following, but even among those, there seems to be a large majority that are [sic] paralyzed by fear of losing some aspect of dunya [the material world]. They would prefer to keep their admiration for you in their hearts." This statement should have raised a major red flag as should have Hasan's writing that "Allah … lifted the veil from my eyes about 8-9 years ago, and I have been striving for jannat firdaus [the highest level of paradise, reserved for religious martyrs] ever since. I hope, Inshallah, my endeavor will be realized." Tracking correspondences and interactions with Islamist websites seems a rather elementary precaution to take in the wake of recognized instances of Islamist radicalization via the Internet. The Webster report's contention that Hasan's e-mails were not suspect because they were consistent with legitimate "research" is farfetched; they would have had to assume that Hasan was only posing as a devout Muslim. Further, the idea that interviewing him would tip off Awlaki is specious as there was no need to confront him in person, simply to track his actions. If law enforcement had done so, they might have discovered the clear warning signs that Hasan displayed prior to his attack. For example, Muslims who disagree with radical ideologies avoid extremists. In turn, extremists generally shun moderates as they will not tolerate what they consider an inferior form of religious belief. The Webster report itself notes: "Leaders are essential to radicalization." Awlaki is labeled numerous times as a "charismatic Islamic cleric" so why not assume that Hasan was undergoing "radicalization" if not already radicalized? As a result of generic guidelines that avoided reference to violent Islamism, further hampered by copious legal safeguards to civil liberties, agents labeled Awlaki merely a propagandist and not a threat. A lack of verbal specificity of incitement to violence was taken at face value, despite the plots with which Awlaki was connected. But what further alarms are needed when a U.S. soldier writes as the Webster commission reported to such a "propagandist" that the "Qur'an … states to fight your enemies as they fight you ... So, I would assume that [a] suicide bomber whose aim is to kill enemy soldiers … but also kill[s] innocents in the process is acceptable. Furthermore, if enemy soldiers are using other tactics that are unethical/unconscionable than [sic] those same tactics may be used?" On Christmas day 2009, less than two months after the Fort Hood attack, another Awlaki protégé, Umar Farouk Abdulmutallab, boarded Northwest Airlines Flight 253 to Detroit with plastic explosives hidden in his underwear. British authorities admitted that they knew of his Internet extremism three years prior to the attempted attack but failed to flag him. Worse, intelligence regarding his radicalization was apparently relayed to U.S. agencies, yet he was able to board the flight undisturbed. Following Abdulmutallab's apprehension, President Obama criticized U.S. intelligence agencies for "systemic failure" while a subsequent report by the Senate Intelligence Committee described it as a "failure to connect, integrate, and understand the intelligence we had." If there remains any doubt that the government and intelligence agencies' policy has been to dissociate jihadists like Hasan from Islamist motivations (a fact that Hasan himself would probably find deeply offensive), that should be dispelled by testimony provided in a hearing before the House Appropriations Committee on August 1, 2012, called by Rep. Frank Wolf (Republican, Va.). Under questioning regarding the FBI's classification of Awlaki as a "propagandist," Mark F. Giuliano, executive assistant director, National Security Branch of the FBI, refused to acknowledge whether violent Islamic extremism was Hasan's motivation for the attack, claiming that Awlaki had changed over the years. After he went to prison in Yemen in 2006 and 2007, he "came back up online in early '08, [and] he still had somewhat of a moderate tone but—but began to be more of a propagandist, began to show more radical tendencies, but we could not and did not see him as operational or in an operational role at that time." The fact is that Awlaki had involvement in 9/11 and affiliation with radicals since at least 1999, having attained a high degree of radicalization and esteem in the Islamist world despite his upbringing as a U.S. citizen. As a member of the U.S. military, Hasan repeatedly contacted a known radical cleric in Yemen without raising alarms. Using his real name and location, he solicited advice about the permissibility of murdering non-Muslims. The military, adhering to politically correct protocols, ignored multiple warning signs or failed to share the information with the intelligence community. The assumption that Hasan was conducting research on Islam, and in that context was e-mailing Awlaki, should have increased not lessened scrutiny. Ironically, if Hasan had bothered to cover his tracks, perhaps more suspicion would have been raised. The fact that such lapses and "failures of intelligence" continue to plague U.S. security agencies is in itself an abysmal failure. The continuing denial of Islamism as motivator in countless plots on American soil is indisputable. If Islamic radicalization and its deadly impact continue to be overlooked in favor of privacy protection and misconceived notions of religious freedom, and if these policies remain intact in intelligence protocols, such tragedies as the Fort Hood massacre are likely to recur. Islamists often raise the specter of "Islamophobia" whenever any legitimate question about or criticism of Islam is broached. But real Islamophobia stalks the corridors of Washington and other Western capitols: The fear of upsetting Muslims of any stripe is so rampant that the security of the American citizenry has been compromised. Teri Blumenfeld is a researcher with the Middle East Forum, and with the Department of Justice for terror fundraising trials. "Executive Summary," The 9/11 Commission Report, Final Report of the National Commission on Terrorist Attacks upon the United States, July 22, 2004. "Pulling The Islamic Veil over American Free Speech," Investor's Business Daily (Los Angeles), Sept. 13, 2012. James Jay Carafano, Steve Bucci, and Jessica Zuckerman, "Fifty Terror Plots Foiled Since 9/11: The Homegrown Threat and the Long War on Terrorism," Heritage Foundation Backgrounder, Washington, D.C., Apr. 25, 2012. Final Report of the William H. Webster Commission on the Federal Bureau of Investigation, Counterterrorism Intelligence, and the Events at Fort Hood, Texas on November 5, 2009 (hereafter Webster report), p. 150. "Ticking Time Bomb: Fort Hood Massacre Could Have Been Prevented," U.S. Senate Committee on Homeland Security and Governmental Affairs, Washington, D.C., Feb. 3, 2011. Pamela Geller, "Webster Commission FBI Report on Fort Hood Massacre Whitewashes Islam," Atlas Shrugs, July 22, 2012. "Lieberman Collins Respond to Webster Report," U.S. Senate Committee on Homeland Security and Governmental Affairs, Washington, D.C., July 19, 2012. C. Dyer, et al., "Countering Violent Islamic Extremism," FBI Law Enforcement Bulletin, Dec. 2007, p. 6. The Washington Post, Feb. 27, 2008. See, for example, The Telegraph (London), Dec. 27, 2008; The Toronto Star, Oct. 18, 2009. The Washington Post, Feb. 10, 2012. Time Magazine, May 7, 2010. Sydney (Aus.) Morning Herald, Jan. 4, 2010. Jerry Gordon, "The 'Systemic Failure' in Intelligence that Could Have Prevented the Flight 253 Attempted Bombing," New English Review, Jan. 2010. The New York Times, Dec. 29, 2009. McClatchy Washington Bureau, Mar. 2, 2011; see, also, news release, U.S. Senate Select Committee on Intelligence, Washington, D.C., May 18, 2010. PJ Media, Aug. 16, 2012; Mark Giuliano, testimony before U.S. House Appropriations Committee, Washington, D.C., Aug. 1, 2012, C-Span. The Telegraph, Dec. 27, 2008; The New York Daily News, Nov. 11, 2009. "Complete 911 Timeline: Anwar al-Awlaki," History Commons, accessed Dec. 7, 2012; "Anwar Nasser Aulaqi," FBI memoranda, Washington, D.C., Sept. 26, 2001, on Intelwire.com. Related Topics: Muslims in the United States, Radical Islam, Terrorism | Teri Blumenfeld | Spring 2013 MEQ receive the latest by email: subscribe to the free mef mailing list This text may be reposted or forwarded so long as it is presented as an integral whole with complete and accurate information provided about its author, date, place of publication, and original URL.